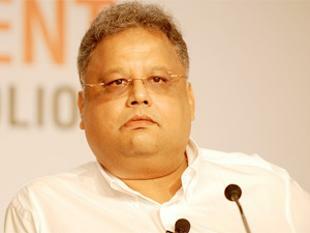 Rakesh Jhunjhunwala is most valued investor of the stock market. His advice is followed by many investors blindly. Rakesh Jhunjhunwala thinks that 2016 will be very good year for the stock market. As per him “Mother of all bull runs is ahead for the Indian market”. He shared this detail in his recent interview with ET. He also said that he is positive on the pharma and housing finance companies stock. He cautioned investor to stay away from banking stocks. As per him, India is going to grow by 9-10 per cent for a decade to decades. Here is top 5 stocks and sector for 2016 as per RJ. Till the year 2015 Rakesh Jhunjhunwala was bullish on Titan, Lupin, CRISIL, MCX and Rallis India, but surprisingly for 2016, he removed CRISIL, Lupin, and MCX from his favorite stock and added Aurobindo Pharma, IndiGo and Tata Motors in his favorite stock list. His top 5 stocks of 2015 had given magnificent returns till date. 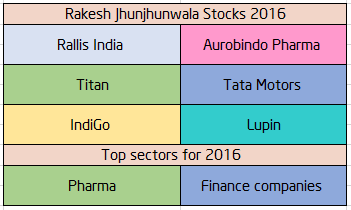 Let’s take a look at top 5 stocks and sector for 2016 as per RJ. Rallis India – Rallis India is dealing in agrochemical space. Rakesh Jhunjhunwala is holding this stock since past seven years. This stock is giving consistent positive returns since past few years. Last year also this stock gave double digit return. RJ is bullish on this stock as per him agriculture economy has to come back and this stock will get an advantage of it. Titan – Titan is next hot favorite stock of RJ. 2015 was not a good year for Titan, stock corrected by 7%. However, in coming year this stock is likely to give good returns. In the long run, this stock has given magnificent return to RJ. Rakesh Jhunjhunwala believes that Titan’s fortunes are linked to the Indian consumers and with the growth of Indian consumer this stock is likely to grow. Aurobindo Pharma – Aurobindo Pharma is next stock pick by Rakesh Jhunjhunwala for 2016. As per him, one should hold this stock for long term. This stock is going to grow multifold. In the year 2015, this stock has given a magnificent return of 40%. IndiGo – Aviation sector stock IndiGo is next in the list of Rakesh Jhunjhunwala. Recently he has placed sizable amount bid during IPO. RJ is bullish on IndiGo stock. IndiGo has 85% capacity usage and it is cost leader and cash generator. As per him, this stock is defiantly going to give good returns in years to come. Tata Motors – Tata Motors stock was underperformer stock of 2015. This stock gave negative returns of 20% in 2015 but still Rakesh Jhunjhunwala is bullish on this stock. Tata Motors has launched a number of new cars and they will be introducing a lot of new models in coming years. Rakesh Jhunjhunwala has made the largest investment in this stock and he is extremely bullish on this stock. Source – Stock recommendation and few details of post are taken from Economic Times.